I'm sorting through the trip photos and working on a blog post. We had lots of good food and I want to tell you about some great restaurants, bakeries, and shops. But, until I get everything written up, here's a recipe I made specifically as a treat for Dave--a rice pudding connoisseur. The recipe is from Sherry Yard's Desserts by the Yard. I love that this recipe uses coconut milk for extra flavor, and if you use soy milk or almond milk, this is a vegan recipe. Wash the jasmine rice in several changes of cold water until the water runs clear. 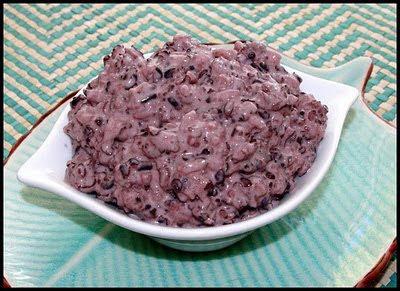 Combine with the black rice, water, and salt in a medium saucepan. Bring to a boil, reduce the heat, cover, and simmer until all of the water is absorbed, about 35 minutes. While the rice is cooking, lightly toast the cardamom seeds in a small skillet over medium heat until fragrant. Remove from heat and grind the seeds with a mortar and pestle or in a spice mill. Measure out 1/8 teaspoon. Add the milk, coconut milk, ground cardamom, and sugar to the rice and stir together. Bring to a boil, reduce heat, and cook, stirring often, about 10 minutes. Stir in the vanilla and scrape into a bowl. **Rice pudding is a great way to use up leftover cooked rice. Can't wait to hear about your trips! The rice pudding makes a pretty dish that's for sure...it sounds pretty tasty also. I'm looking forward to seeing pictures and hearing about your trip. Sounds like you went to some great places. That sounds awesome. I've had black/purple rice and I love it!